As you’ve probably figured out by now, I love to grill. In sunny California, there’s nothing better than throwing a meal on the grill and sipping a cold cocktail as the sun goes down. 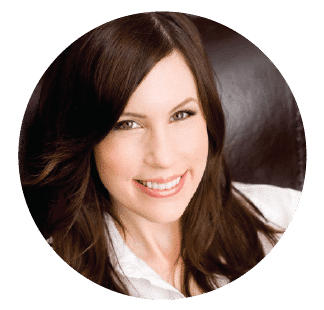 Sometimes I’m a grilling mood, but I want something light… especially on really hot summer nights. 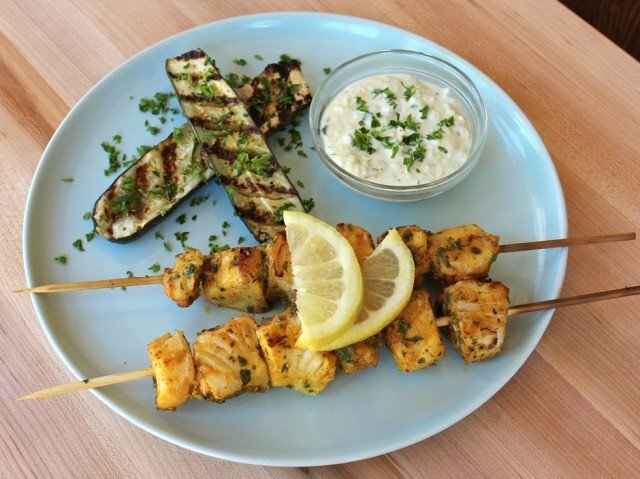 These Marinated Fish Skewers fit the bill. 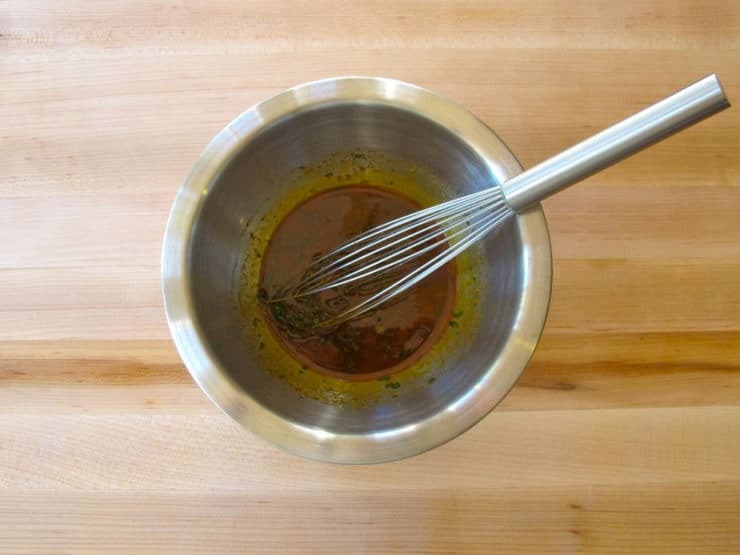 This marinade includes many of my favorite spices, which are also some of the most common spices used in Middle Eastern Sephardic Jewish cooking. Combined with lemon juice in a marinade, they bring lots of aromatic flavor to the fish. Cooking them on a smoky grill adds even more deliciousness. To stretch the meat, you can alternate the fish with onion or pepper slices on the skewer. Choose a firm white fish that won’t flake or fall apart too easily on the grill. Try not to marinate the fish for longer than two hours, or the citrus in the lemon juice will start to break down the meat, which will make it more delicate on the grill. 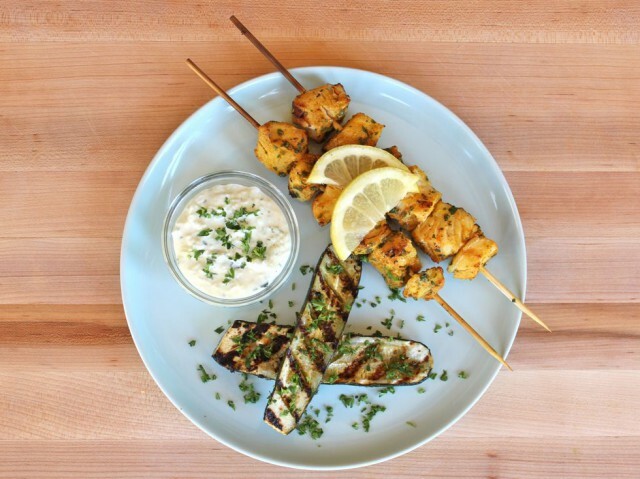 These skewers are a great option for a Labor Day barbecue. In fact, I might just grill some up this weekend! 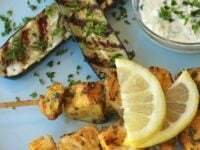 Serve them with tzatziki, tahini sauce or toum for even more flavor; they also go great with my Grilled Lemon Butter Zucchini. Enjoy! 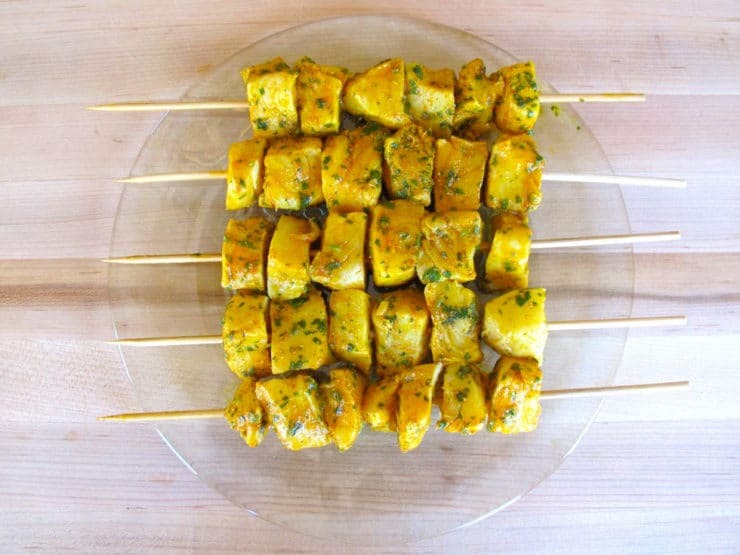 Grilled fish skewers marinated in Sephardic spices and herbs - cumin, paprika, turmeric, garlic, cayenne and cilantro with lemon juice. Kosher. Cut the fish into 1 ½ inch chunks for skewering. In a small bowl, whisk together olive oil, lemon juice, cilantro, crushed garlic, paprika, salt, cumin, turmeric, and cayenne pepper. Place fish chunks in a glass dish. Pour marinade over the fish chunks and stir to coat. Cover with plastic wrap. 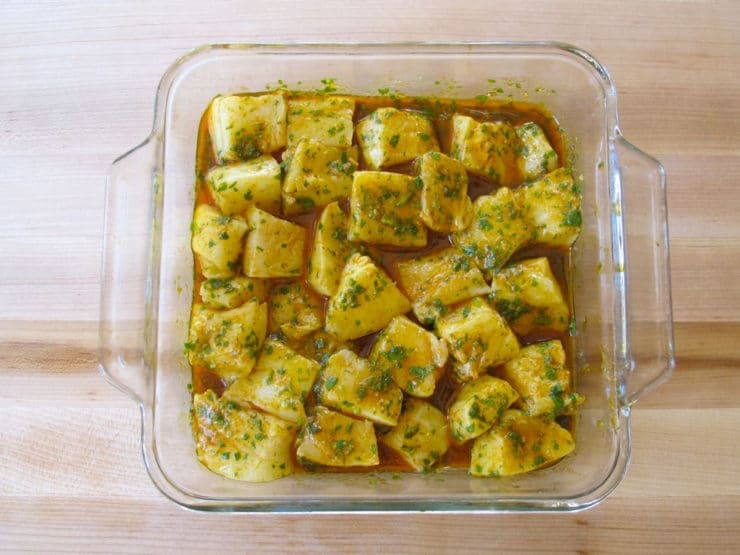 Place in the refrigerator and let the fish marinate for 30 minutes. If using wood skewers, soak them in water while the fish is marinating. This will keep them from burning on the grill. Preheat your grill. Skewer the fish chunks, evenly divided between four wooden skewers. Generously grease the grill. Place the skewers on the grill and cook for about 10 minutes total, turning once during cooking, till the edges are browned and the fish is cooked through. A bit of the fish might stick to the grill-- the less you turn them, the less this will happen. Garnish with chopped cilantro, if desired. 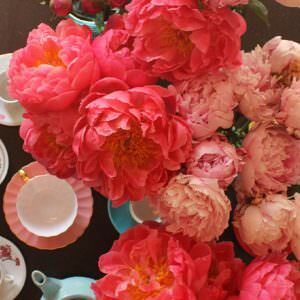 Serve with sliced lemon wedges. 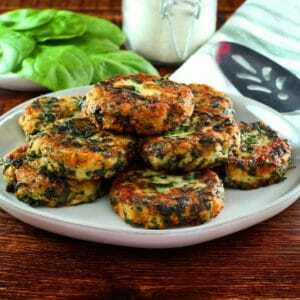 These go great with Tzatziki and my Grilled Lemon Butter Zucchini. Hi Tori! This looks like the recipe I’ve been searching for! Q- since I’m using sea bass and I’m scared it may fall apart especially since I’m baking it in the oven, should I leave the skin on or off??? Is it not nice to serve fish skewers with skin?? Hi Elissa, Tori’s assistant Ashley here. I think it’s a matter of personal preference, but for skewers I would remove the skin. We made these fish kebabs for friends last weekend using salmon instead of white fish and adding zucchini, peppers and onion between the pieces of fish. They were delicious with several people asking for the recipe. Thanks Tori , another excellent recipe. It’s well and truly autumn here in the UK (London), it’s been wet and windy and the days are becoming shorter – the light starts to fade at 3.30pm which can be quite depressing! Your recipe was a wonderful antidote this evening and reminded me of summer days cooking outside on the BBQ. I used what we call over here dogfish or rock salmon which is a kind of small shark. It holds its firm texture & comes out well against strong flavours so can be used in curries as well as kebabs or simply fried. I roasted some cauliflower florets (given summer veg are now out of season) and served this with the kebabs and home-made tzatziki. My wife was very impressed – thanks for the recipe! Tori, thanks for this marinade! Made it for company this evening, using mahi mahi, and it was a hit! I pre-par cooked some veggies that I bought at a farmers market yesterday: green and yellow zucchini; purple pearl onions; red radishes; and yellow pepper chunks. I tossed those veggie chunks in olive oil with a salt/pepper/herbs mix and roasted at 425F for about 20 minutes, while the fish chunks marinated and the wooden skewers soaked. Then I put fish and veggie chunks onto skewers, topped each skewer with a raw cherry tomato, and baked at 375F for 15-20 minutes. I bought a container of tzatziki at Trader Joe’s instead of making my own, because I had enough to do with all of the salads I made as accompaniments. Hey Tori! First of all, these look great. I’ll report back after I try them. Question — what temperature are we to have the grill? Also, on an iPad, the pop up for subscribing to your newsletter comes up every single blessed time you change pages. Since I am a subscriber, it is quite annoying. Perhaps there is a way to bypass those who are already subscribers? Not that big a deal. Just annoying. Thank you for the heads up Counselorchick! I will have my tech guys look into it. Do you have cookies enabled on your iPad? If you don’t, the site cannot sense that you are a return subscriber and the popup will continue to appear. If you do have cookies enabled, that means there is a technical glitch and I will get it fixed for you. Re: the grill, it should be at medium heat. Every grill is a little different, so do check for desired doneness, and make sure the grill is very well greased. Enjoy! Can I make this with an indoor grill pan? Any advice? Yes! They won’t have exactly the same smoky/lightly charred flavor, but they’ll still be tasty. Make sure you grease the grill pan before adding the fish to avoid sticking. Enjoy! Those look absolutely delicious. I’m going to have to try that. I’ve grilled a lot of fish, but never on skewers like that. I am for grilled food from morning till the night:)) Your fish look soo soo good! You did such a great job!!! Look at those perfect grill marks! I love it. This meal looks perfect for summer – especially when it’s too hot to cook inside. And I especially love the cumin in the mix. Delicious! I could totally go for some grilled fish right about now! These sound amazing! The seasoning you used here compliments the fish quite well and this recipe does look fairly easy to do. Awesome pics & well done. What a yummy meal! 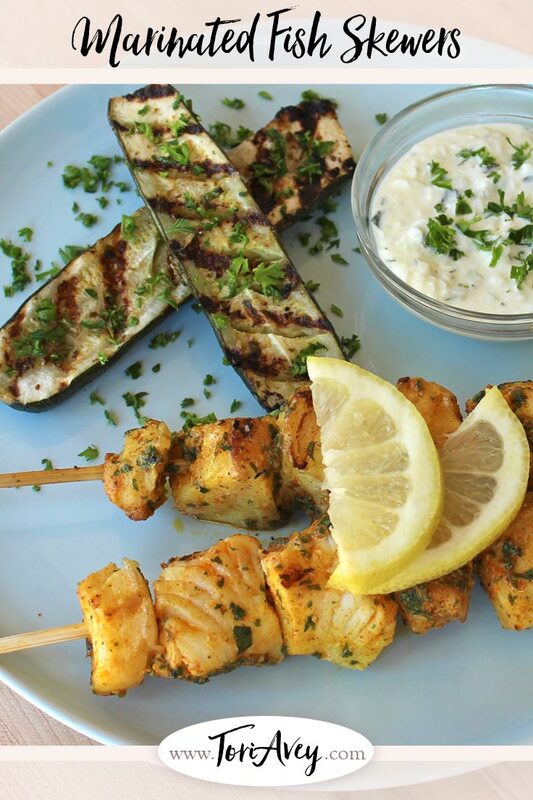 I love the flavors in your kebabs…and that grilled zucchini looks perfect! Happy holiday weekend! Looks delicious! I would have to use chicken due to a seafood allergy, but I think the flavor combo would work…which is good because I adore cilantro! One of these days I am going to come visit you so you can teach me how to grill this well. This looks so good. Fish skewers, so amazing. Great marinade. 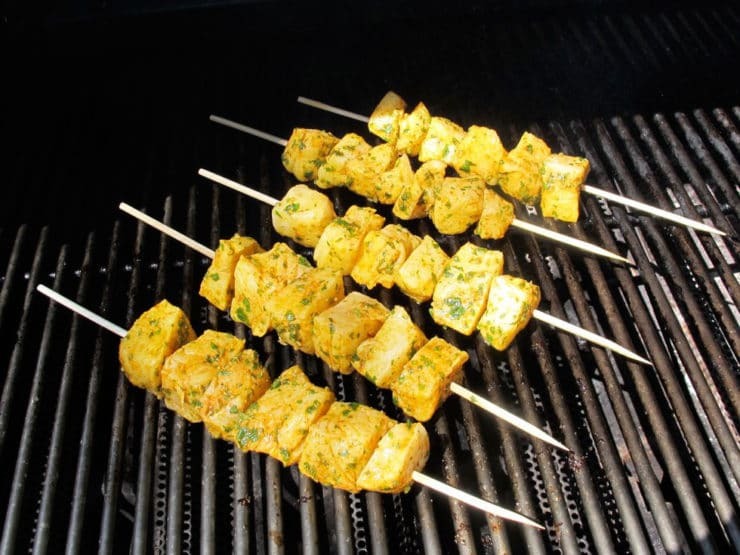 The marinade is a match made in heaven…love the grill marks. I’ll add this one to the bucket list!